Daimler isn’t about to let Tesla own any more ‘firsts’ in electric transportation; the German company revealed the Mercedes-Benz Urban eTruck today in Stuttgart, an all-electric truck with a total admissible weight capacity of 26 tonnes (29 U.S. tons), which makes it the first clean energy big rig of its kind. As the name implies, it’s designed for use in urban environments, capping off the short-sprint end of the heavy transport shipping cycle. That’s in part due to its max range of 200 kilometres (about 124 miles). The prototype Urban eTruck is ready for its close-up, but Daimler notes that we’ll have to wait until a “conceivable” launch window of “the beginning of the next decade” for wide-scale production and real-world use. Still, Daimler beat Tesla to the punch with this reveal, since Tesla CEO Elon Musk only last week that the company is working on an electric Tesla Semi transport truck, with a reveal planned for as early as next year. And Daimler’s not just sitting around waiting for the future launch of its big rig; the same Fuso Canter E-Cell tech it hopes to employ in the Urban eTruck are already in use in a light distribution truck with a 6-tonne (around 7 tons) max capacity, which is currently in testing with customers, including European courier company Hermes. In addition to emissions and environmental benefits, use of vehicles like the Urban eTruck have an immediate upside for city-dwellers: reduced noise. Anyone who’s ever been near a large truck when it trundled down a city street, gearing up from a stop at a traffic light, knows the absolute pain of hearing that huge chugging internal combustion engine wrestling with getting up to a pacing speed. 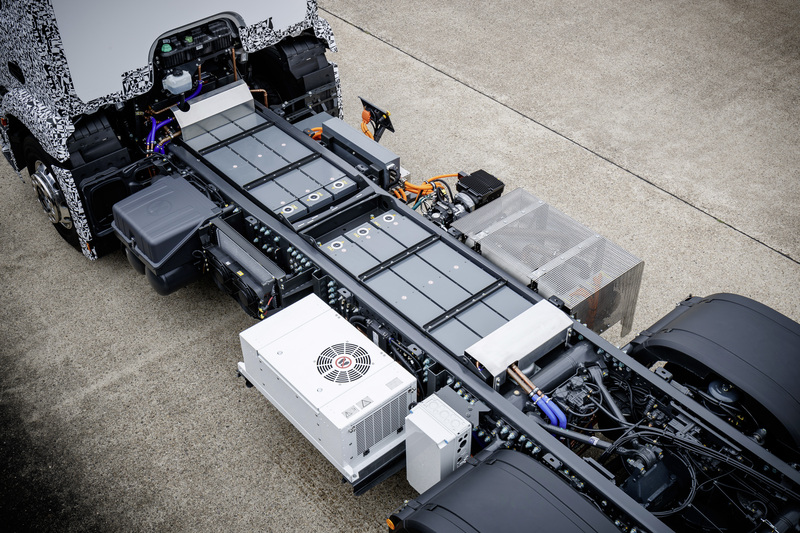 Scaled production of the Urban eTruck seems not to rest on too many tech hurdles any more – Daimler praises the progress of the drive component that powers the vehicle – but what is limiting larger runs is likely the cost-to-efficiency ratio. Daimler says in a press release that it anticipates prices for its batteries to have dropped by a factor of 2.5 between 1997 and 2025, while battery performance will have increased in the same proportion.